Official welcome to Nguenyiel camp – Dr. Frank Dimmock is flanked on his left by the Rev. Simon Chan Luak from Nguenyiel and by the Rev. James Gatdet of the Mekane Yesus Church on his right. My role as Coordinator for Education within the camps was to introduce the visiting team. We were especially glad that Dr. Frank(as we call him) was able to see the goodness of the education program. In each place he expressed the great concern of The Outreach Foundation and its U.S. partners, South Sudanese American Presbyterians, for the education of the children in the camps, and he pledged to continue supporting the work. Let me mention two of the camps we visited. In Kule camp we visited Dhorkortni Parish which hosts one of the first church-based schools supported by The Outreach Foundation. We had an amazing, touching visit with the children and their teachers. Even though they lack many things, they are well-organized and have great hope for the future. Dr. Frank was really full of joy when he saw the children in their school uniforms and how these schools are rebuilding hope in the lives of the children in the camps. From my perspective I see the future of these children: they will be doctors, teachers, pastors, engineers, pilots, and so forth. I bless God for the volunteer teachers in the camps who are working to teach children and adults and so bringing them hope. The other place I want to mention is the Nguenyiel Refugee Camp, the newest and largest of the refugee camps. When we got there the youth and the children of the camp received us, marching on the streets by our side. They were so happy to welcome Dr. Frank and thank The Outreach Foundation and the Sudanese Presbyterians from the U.S. In addition to supporting schools, they also have donated musical instruments for the youth ministries in each camp. This November the youth of Nguenyiel received a set of instruments with joy. Altogether we visited fifteen preschools and four adult literacy programs during our three-day tour of the six camps. 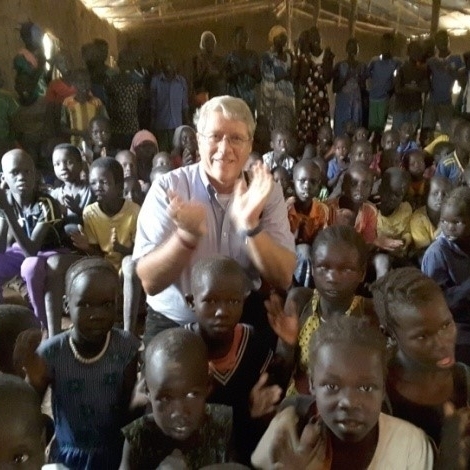 Dr. Frank and the visiting team saw first-hand that Christian-based education is developing among the South Sudanese refugees in the camps in Gambella, Ethiopia. All those in the refugee communities are witnessing the goodness of God at work through his loving people. Glory be to him in the Highest Heaven. Thank you very much Dr. Frank. May God bless you and your family! Read more about Rebuilding Hope in South Sudan HERE. The Outreach Foundation is seeking gifts totaling $100,000 to address needs requested by the Presbyterian Church of South Sudan: Bibles, hymnals, education, trauma healing, and emergency relief.